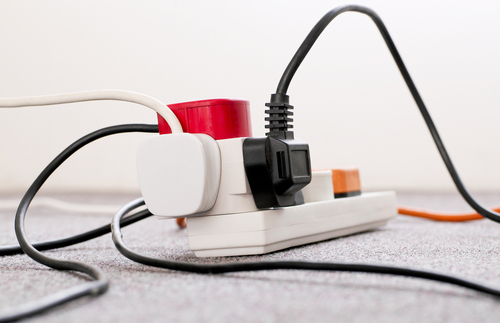 We often visit offices where computers, printers, screens, scanners, lamps, smartphones and other chargers are all plugged into overloaded sockets and boards. If you’re working with overloaded electrical circuits you can be running the risk of electrocution or fire. If you’re using a multi-socket board then make sure it’s a branded product from a reputable retailer. Make sure there’s plenty of air circulating around any multi-socket boards; don’t tuck them behind a cupboard of desk because they look untidy. Make sure that your electric cables aren’t bent, kinked or knotted. Don’t run power cables under rugs or where chairs can roll over them. Don’t plug in non-essential electrical items until you need to use them. If possible, charge your battery-operated devices somewhere else. Have a qualified electrician carry out an electrical inspection. If you would like to know more about safely adding electrical sockets in your office, just give us a call.